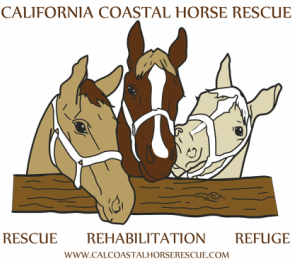 CCHR's Community Connection is part of California Coastal Horse Rescue's continuing commitment to not only its horses and its rescue and adoption efforts, but to the larger community as well. CCHR strives to support education, literacy and social well-being through its horses and its ranch facility. Part of the rehabilitation CCHR offers to the horses in its care is to give them a wide variety of activities to engage in. One of the most important and fun "duties" of the horses is to be ambassadors for all animals in need and also to "give back" to the human community that helps to protect and support them. The CCHR "Learn, Care & Share" Program is designed to introduce children and young people to horses and to teach them equine basics and animal care. The children get to meet all of the horses up close and see how horses interact with people and other horses. There is carefully supervised "hands-on" time with the horses and there are always fun, horse-inspired crafts to work on, as well. We believe that children benefit from interacting with the CCHR horses (and animals in general) because we feel that learning about compassion and empathy early in life can help build moral character, reduce violence and build a sense of responsibility. When its citizens are more caring towards each other and the animals who live among them, society, as a whole, reaps the benefits. Very importantly, this program also allows the CCHR horses to interact with children. For horses with trust issues, we have found that children offer them gentle and happy interaction which can, in turn, help these horses to more readily accept people in general. We love that our community can play such a great role in the rehabilitation of the horses that CCHR has rescued! CCHR's Pony Tales Reading Club is for children ages 6-10 years and gives children the opportunity to read in a healthy, outdoor setting. Children may bring their own books to read or can select books to read from the reading club library at the ranch. We have found that even the shyest of kids has no problem when it comes to reading aloud to one of the CCHR horses! CCHR offers these programs free of charge to schools, groups and clubs. For more information on the "Learn, Care & Share" Program or the Pony Tales Reading Club, please contact us at (805) 758-8312. The CCHR Ranch is also an ideal place for individuals, groups or schools who might be seeking new areas in which to donate their community service time. Ranch projects have brought a wide variety of groups to the rescue to generously donate their time and to work on team-building skills.